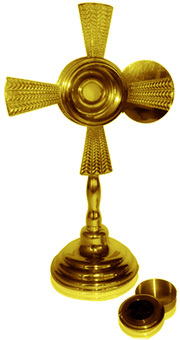 Elegant Monstrance forged in Pewter and gold plated (24 Kt) by skilful artisans. It displays a classic and elegant design. It includes a removable luna. The set includes the lunette case. Note:This Monstrance can hold a 2.5" (6.5 cm) or a 1.2" (3 cm) diameter Host. Please choose below. Special offer: Free shipping Worldwide!